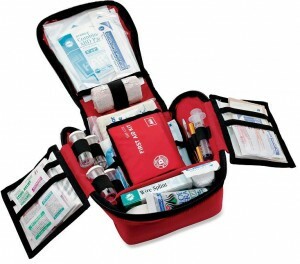 Every first aid kit contains more or less the same equipment. It is important that you understand the purpose of all equipment and are able to use the contents properly. The following instructions will help you use each piece of equipment properly and carefully. The list only gives you basic information about how to use the specified equipment. Therefore, it is recommended that you acquire proper training for first aid and CPR to ensure that you are ready for any emergency situation. any infection from taking place. Exam gloves are available in varied sizes; therefore, buy a stock of exam gloves that fit your hands perfectly. Adhesive tape: Adhesive tape is used to keep the gauze intact. It can also be used to cover blisters and hold cuts together, until the casualty can get stitches done. Gauze: This is a porous fiber that is used to encourage clot formation and thus, prevent excessive bleeding from taking place. Some of the most common types of sterile gauze include ‘four-by-fours’. It is better if you buy the wrapped ones individually, rather than in bulk. For larger injuries, you may need larger pads such as 5×9 inch pad, which are often used in surgeries, also known as abdominal pads. You can also use roller gauze to wrap injuries in the arm or leg in order to stop bleeding, without the need for adhesive tape. Elastic or crepe bandages: These are often used to control swelling, usually in sprains with splints to immobilize bone injuries. They are thus required to apply pressure on the affected regions, keep dressings intact and provide support. Adhesive bandages: These are the most frequently used components of first aid kits. They are used to cover minor cuts and wounds. They are commonly known as band aids. Make sure you clean the cut or wound before applying any band aids, and replace the band aids regularly, at least once a day to prevent infection. Some people are allergic to adhesive bandages. Triangular bandages: These bandages are non-elastic bandages used to splint broken bone injuries, immobilize injured arms and hold gauze in place. They are significantly used in slinging injured arms, dislocated shoulders and broken collar bones. They are also known as cravats and are used to stop bleeding as well. Non-adhesive dressing: These are best for covering burns or abraded skin. They are ideal for such wounds as adhesive dressing should never be used on abraded or burnt skin. Sterile eye wash: This is used to flush the eyes to remove eyelashes, sand, dust, insects or other small particles lying on the surface of the eyeball. Do not try to remove any object embedded deeply in any part of the body and call for emergency medical help immediately. Scissors: These are used to cut pieces of cloth, bandage, gauze, splints and tape. Scissors and trauma splints have edges, especially designed to be used against the casualty’s skin without breaking it. Tweezers: These are useful in removing foreign objects that have landed on the skin. Tweezers are only designed to remove small objects such as splinters, ticks or anything similar that is embedded in the skin. They can also be used to remove dirt and sand from lacerations. Do not attempt at removing large objects that have penetrated the skin or objects embedded in the eye with tweezers. Seek medical assistance in case of severe injuries.